U.S. 84 shifted from its Main Street alignment through Collins onto a new four-lane bypass north of town. The old alignment was redesignated Mississippi 184. 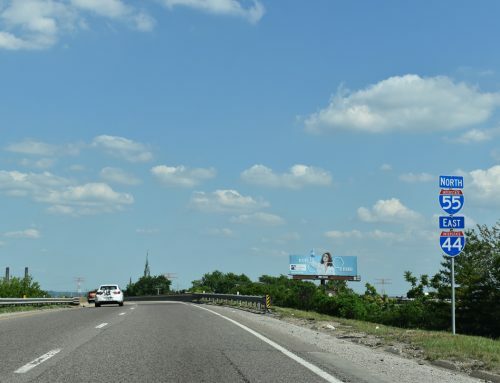 A new partial-cloverleaf interchange joins U.S. 49 with the relocated U.S. 84. 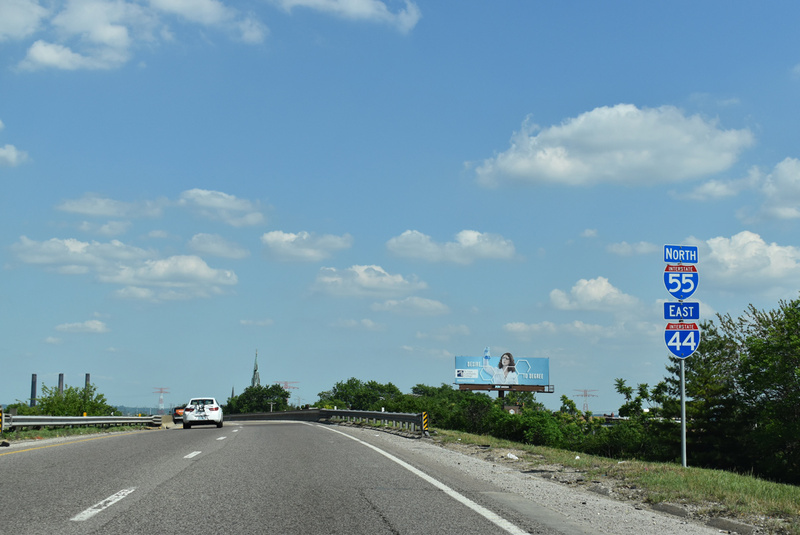 U.S. 49’s approach to Interstates 20 and 55 at Richland was upgraded to an expressway recently. The controlled-access route bypasses some of the businesses, now served by frontage roads, from the split with Old Highway 49 north to U.S. 49’s merge onto Interstate 20 west & 55 south. Interstates 20 & 55 westbound near their split in south Jackson. 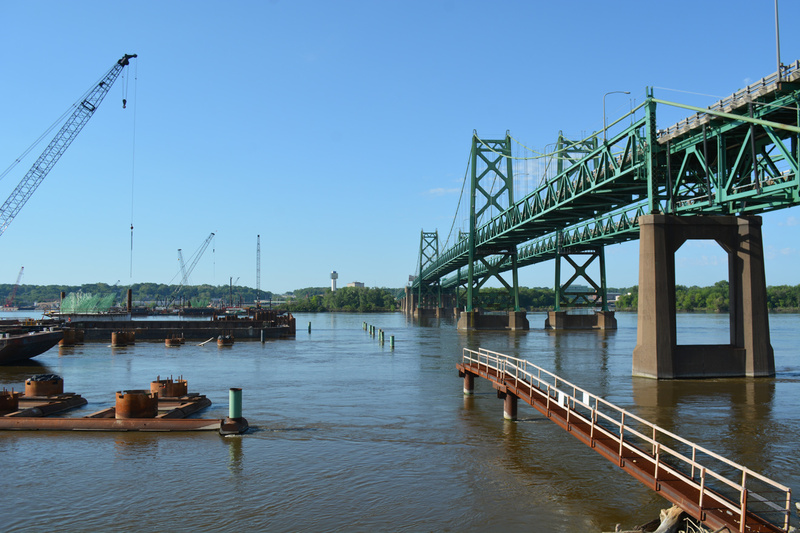 Road work is underway presently to replace the westbound bridge over U.S. 51 / State Street. 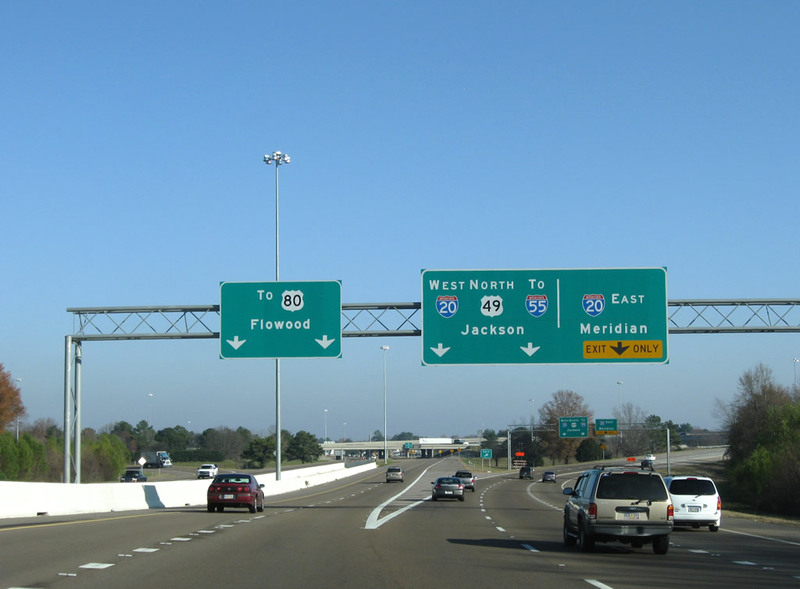 Mississippi 7 joins Interstate 55 north from Grenada between Exits 206 and 211. Several Mississippi state highways double as scenic routes. Where these designations exist, blue on white shields are used. 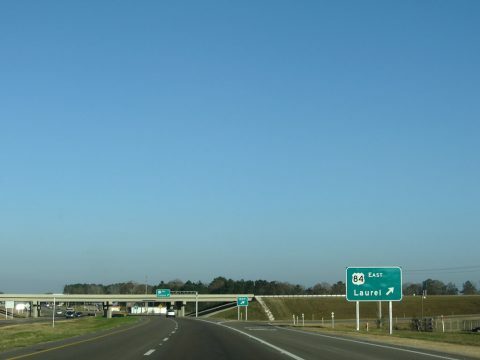 This assembly lies along the northbound Interstate 55 off-ramp at Exit 227. Interstate 69 northbound at its merge onto Interstate 55 north at Hernando. 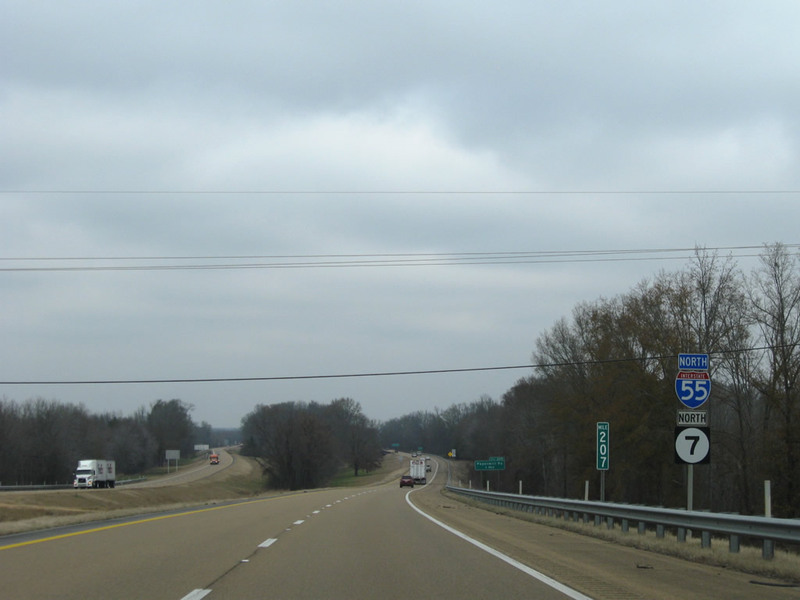 Interstate 55 and 69 now cosign northward to the Tennessee state line. 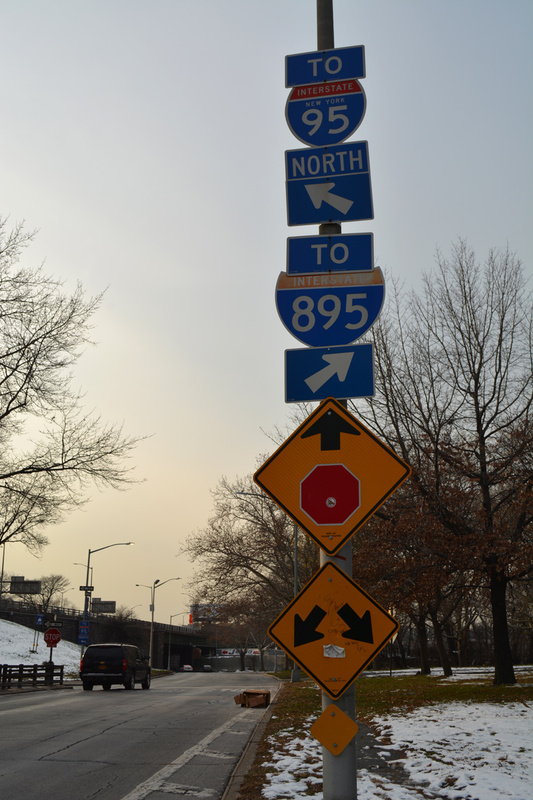 Additionally all Interstate shields installed from late 2008 onwards will include the state-name. 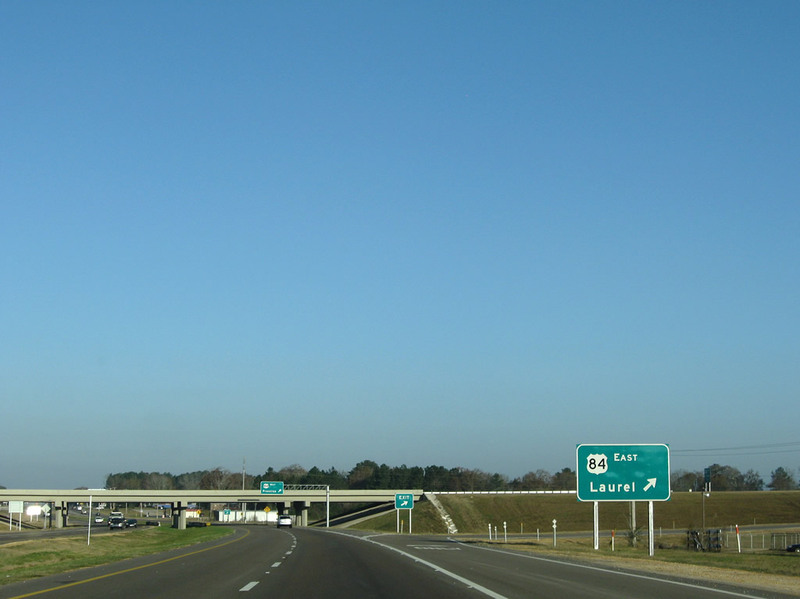 Interstate 55 & 69 northbound signage at the Exit 291 (State Line Road / Main Street), the final Mississippi interchange. 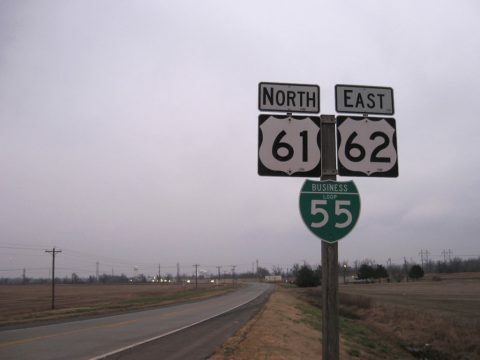 Upon entering Tennessee, Interstate 69 disappears with the exception of Future I-69 Corridor signs. Interstate 240 west/north at the redesigned interchange with Interstate 40 east of downtown Memphis. 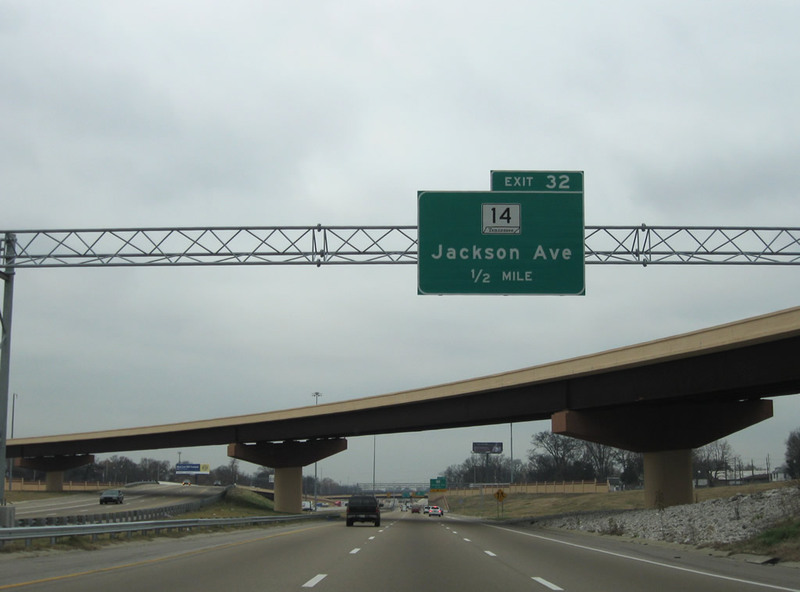 This interchange originally included provisions for unconstructed Interstate 40 leading east to Overton Park. When Interstate 40 was cancelled through the parkland, the I-40 designation shifted to the northern half of Interstate 240. 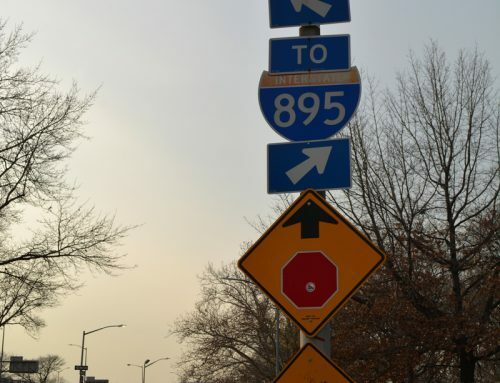 It was not until recent years that work redesigned the previous cloverleaf interchange to remove unused ramps and upgrade the movements between Interstates 40 & 240 to include high speed ramps. Pictured here is the new flyover carrying drivers from Interstate 240 onto Interstate 40 west. Upgrades also took place at the Interstates 40 and 240 eastern junction. A new flyover was added for movements between I-40 west to I-240 west. 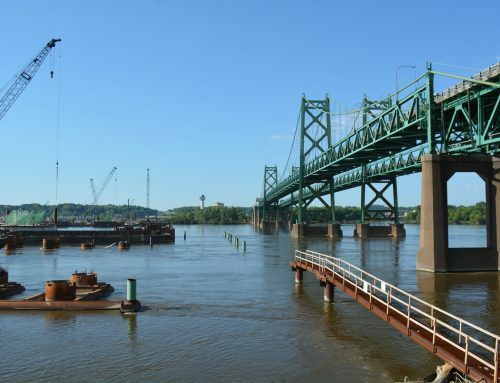 A ramp stub is in place for further upgrades for the I-40 westbound ramp onto the beltway. In this scene I-40 exits itself via a one-lane left-hand ramp (Exit 12C) as Interstate 240 begins. 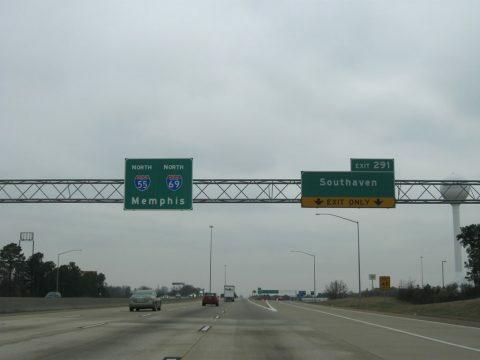 Entering the six-ramp partial-cloverleaf interchange (Exit 9) with Mallory Avenue along Interstate 55 north in Memphis. 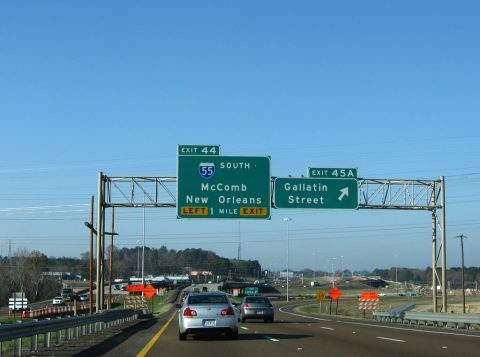 The exit is currently closed as TNDOT is in the process of reconstructing the junction into a single point urban interchange (SPUI) http://www.tdot.state.tn.us/i55mallory/default.htm. Work commenced in 2008 and will be completed in 2010. 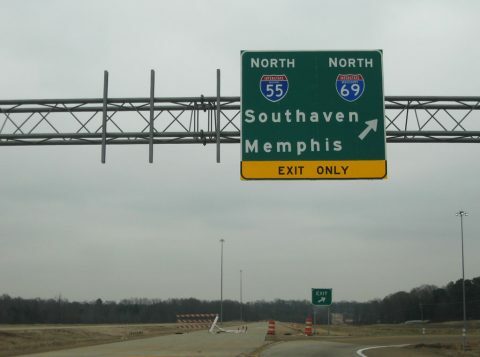 One of the most substandard connections along the Interstate system is the Interstate 55 cloverleaf interchange with Crump Boulevard in Memphis. The northbound mainline of I-55 utilizes a loop ramp from the freeway north onto Crump Boulevard west leading toward the Mississippi River Bridge. This scene looks at the I-55 northbound mainline at the Crump Boulevard southbound loop ramp. 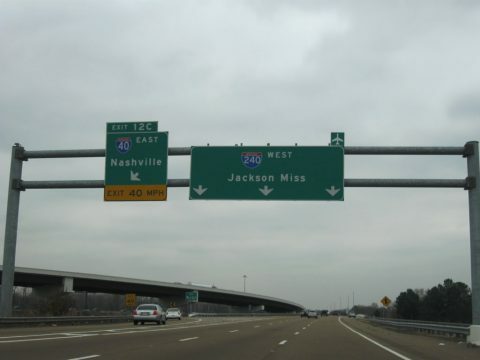 Fortunately TNDOT will be upgrading the interchange in the near future http://www.tdot.state.tn.us/i55/default.htm. Both Alternatives under study involve shifting the Interstate 55 mainline onto a new alignment skimming the southwestern quadrant of the current cloverleaf interchange. 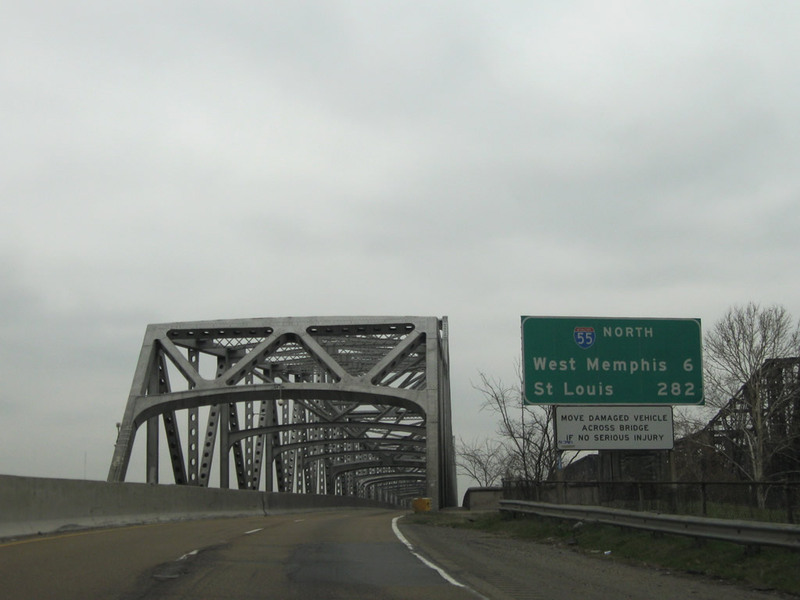 Interstate 55 crosses the Mississippi between Memphis and West Memphis over the equally substandard Memphis & Arkansas Bridge. 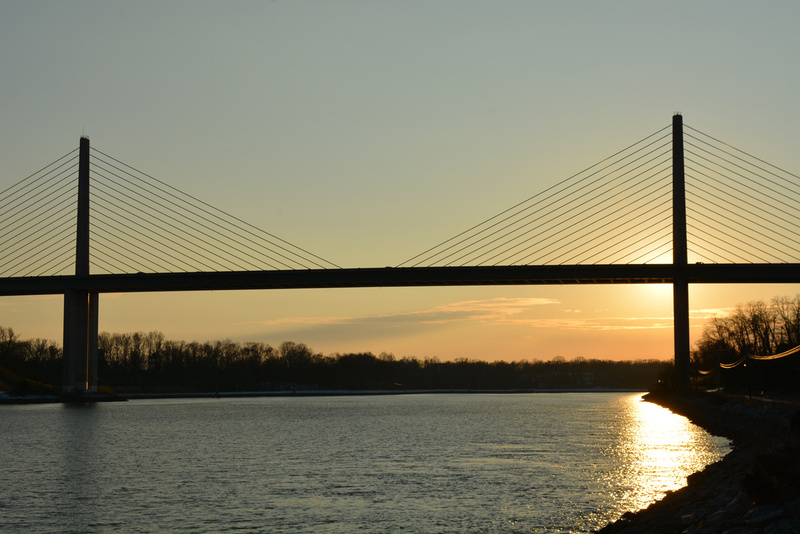 The cantilever span opened in 1949. 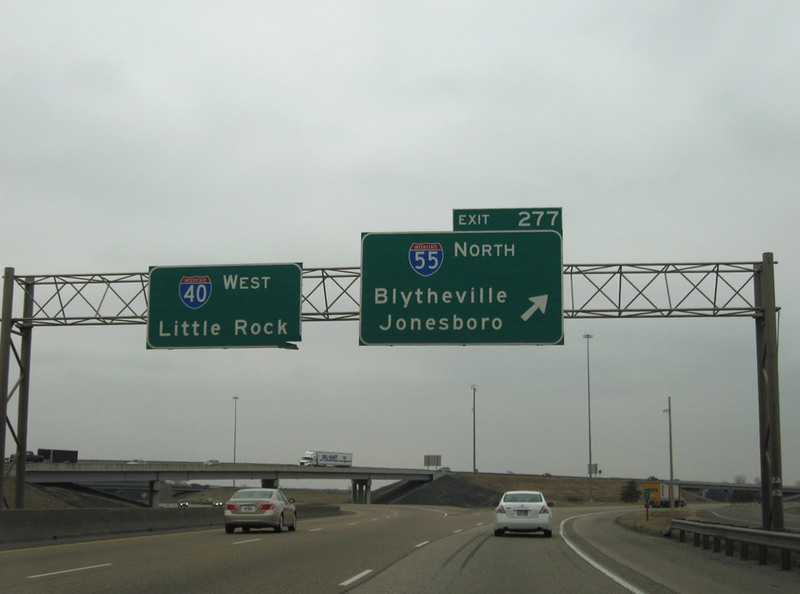 Westbound at the split of Interstate 40 to Little Rock and 55 north to Blytheville. Road work is currently underway at the merge of the two freeways ahead of Exit 279 to the east. Northbound future Interstate 555 and U.S. 63 at the recently completed Exit 7 diamond interchange with Arkansas 135. 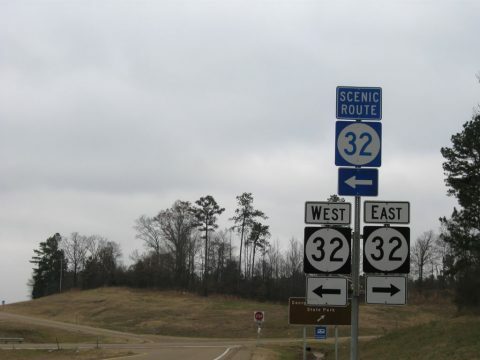 There are no remaining at-grade intersections between Arkansas 135 and Interstate 55. 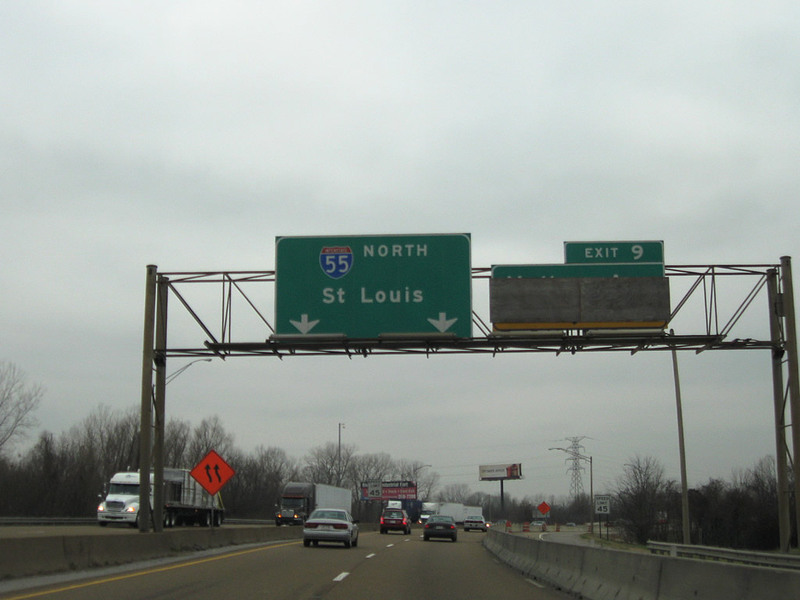 A sharp ramp carries drivers from Future Interstate 555 & U.S. 63 south onto Interstate 55 north. 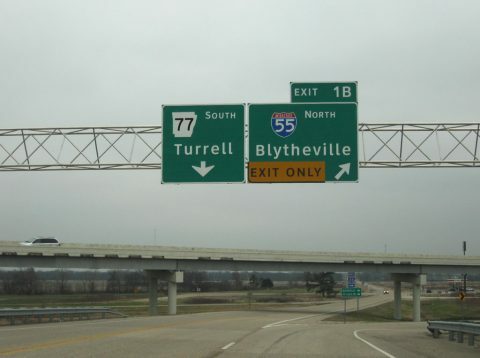 Arkansas 77 travels south from the directional cloverleaf interchange into Turrell. 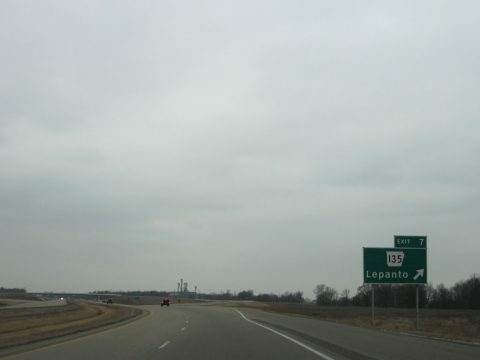 The northbound beginning of Business Loop Interstate 55 near New Madrid, Missouri. This is the first business loop of I-55 in Missouri. 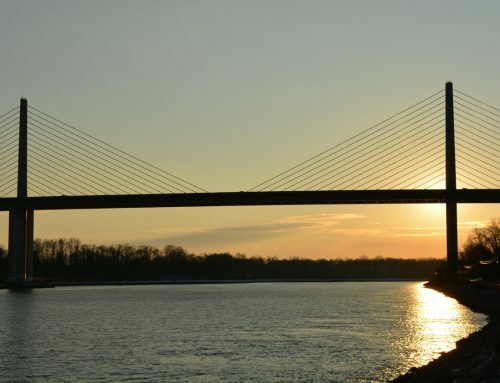 Others exist further north at Cape Girardeau (Exit 93B), Jackson (Exit 99), Crystal City (Exit 174A) and Herculaneum (Exit 178). excellent! looking forward to Miss state-named shields from all the routes. We haven’t seen 220 yet, but hopefully they’ll put one up soon. lots of variety in the Miss. shields. I wonder if they’re experimenting to find the best layout and they’ll settle with one in a little while. 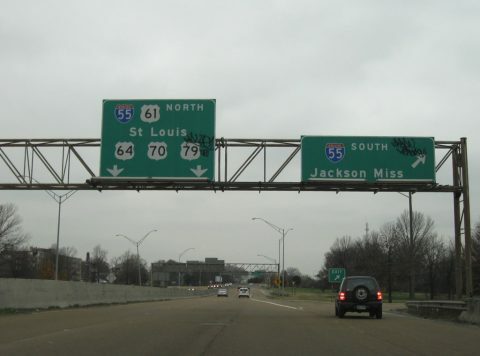 All of the Interstate 55 Mississippi shields I have seen thus far were done only with Series C. The pair for I-59 on overheads at US 98’s junction with the freeway were done with Series D. All of the state-named I-69’s were done with Series D as well. Perhaps there will be Series-specific conventions depending upon the route? Did you make this trip? Needless ta say,if/when ya ever get over this way stop by. I always got a cold one, and I’ll have the wife crank up the stove.